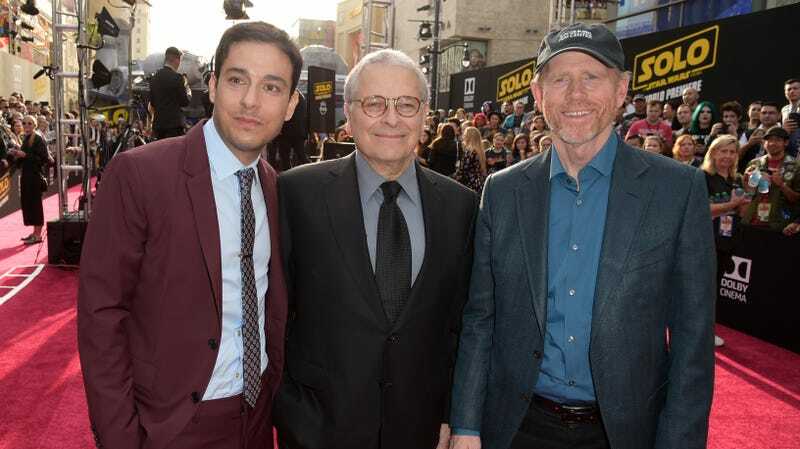 Lawrence Kasdan (middle) with son and Solo co-writer Jonathan Kasdan (left) and director Ron Howard (right). Filmmaker Lawrence Kasdan isn’t responsible for creating the Star Wars saga so much as bringing it to life. A New York Times profile of the writer and his son, Jonathan, Kasdan details his early involvement, after being hired on The Empire Strikes Back. “I’ll tell you what we’re doing—you write it,” Lucas told him at the time. Had Kasdan been in full control of the story, however, the franchise would look much, much different. He also would never have written Solo: A Star Wars Story, the franchise spin-off he penned with Jonathan that opened this past weekend. Kasdan reveals that writing Solo was hugely satisfying for him. Saying that he was initially resistant to the studio’s efforts to bring him back into the Star Wars universe, Kasdan found himself intrigued with the idea of a movie entirely about the character. “That was the only one that could possibly have gotten me,” he says of his decision to get involved with Lucasfilm’s latest slate of Star Wars flicks. He also admits that, though he was initially annoyed at Ford’s improvised “I know” in response to Leia’s “I love you,” he now wishes he’d wrote it. Ford doesn’t buy it, though. “Oh, that’s ridiculous. He’s still mad,” cracks Ford. “He wasn’t as mad as George was. But then, I had [director Irvin] Kershner to share the blame. I can’t apologize. I still think it was just a better line.” Hard to argue there.